Grace has been the most preached/sung/written about topic in recent years. Anyone who’s anyone has wanted to get in on the act and preach their series, write their book or compose their song about it. No doubt much of it is good – but judging from some of what reaches my ears second-hand, there is plenty that is not: wrong emphasis, overemphasis, one-sidedness, imbalance, half-truth (a lie), outright heresy. Even where the source teaching may not be errant, it often leaves itself open to wrong conclusions/applications, especially among the immature. I have had concerns for some years now about what I hear from some Christians and see in some churches. By the Spirit you know instinctively that some of it is not right – and careful study of the Word confirms that. I’ve not heard/ read any of the teachers that (allegedly) are marketing error – so I’m not responding to any one or more teachers or teachings. From a large and sometimes complex body of material, this is just an attempt to provide a distilled essence of the Bible’s teaching on grace. Test it against Scripture alone – not any popular teacher or teaching. I want to do this by showing two things that grace is (in simplicity/essence) and two things that it is not (so protecting us from some of the wrong conclusions about and applications of grace that we see around us today). Ps 103/8,10: [David] The Lord is compassionate and gracious, slow to anger, abounding in love…he does not treat us as our sins deserve or repay us according to our iniquities. Jb 33/27: [Elihu] I have sinned, and perverted what was right, but I did not get what I deserved. Er 9/13: you have punished us less than our sins have deserved. La 3/22: Because of the Lord’s great love we are not consumed [utterly destroyed for our sin]. Dt 9/5f: It is not because of your righteousness or your integrity that you are going in to take possession of their land…Understand, then, that it is not because of your righteousness that the Lord your God is giving you this good land to possess, for you are a stiff-necked people. Grace is God not treating us as our sins deserve; he gives us what we do not deserve: despite what we are, he saves. Grace is thus very close in meaning to mercy. They can best be distinguished thus: mercy is God not giving us what we do deserve (judgement); grace is God giving us what we do not deserve (salvation). Grace is even more surprising given the repeated statements – in OT and NT – that we will get what we deserve: “Their condemnation is deserved” (Ro 3/8); “For we must all appear before the judgement seat of Christ, that each one may receive what is due to him for the things done while in the body, whether good or bad” (2 Co 5/10) Certainly, outside of God’s grace (and if we reject it), we get what we deserve (the Bible calls this the justice of God). But inside his grace, we don’t! These first of two meanings/applications of the grace of God I found in Scripture others have called saving/accepting grace. It is the grace celebrated in hymns (Amazing grace), songs (Only by grace can we enter) and sayings (God’s riches at Christ’s expense). 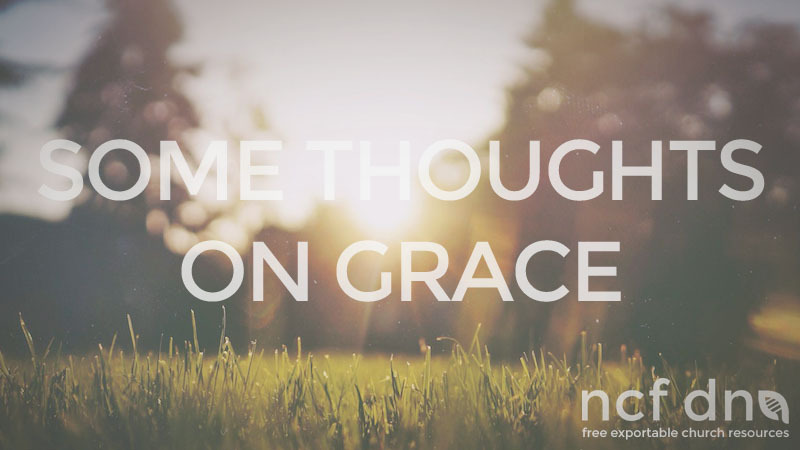 About half the times the word “grace” appears in Scripture it has this meaning, e.g. : “and are justified freely by his grace through the redemption that came by Christ Jesus” (Ro 3/24 [v21-31]); “it is by grace you have been saved…the incomparable riches of his grace, expressed in his kindness to us in CJ. For it is by grace you have been saved” (Ep 2/5,7f [v1-10]); “For the grace of God that brings salvation has appeared to all men” (Tt 2/11); “having been justified by his grace” (Tt 3/7 [v3-7]). Grace exists along with love, kindness, mercy, atonement, righteousness and faith at the heart of our salvation. This is not the place to expound on grace’s exact position/function alongside these other things, but in essence: God in his love and kindness wants to save us; he sends Jesus to die in our place and so atone for our sin; God can now (without compromising holiness) declare us righteous and be reconciled to us; it is his grace which applies the saving work of the cross to our lives, and our faith by which we receive that grace and salvation. Grace: Jesus got what he didn’t deserve so we could get what we don’t deserve. This second meaning/application of “grace” I found in Scripture others have called living/enabling grace. It is only by grace that we can be reconciled to God and become his children; it is just as much only by grace ever thereafter that we can live how he wants us to live (holiness in Christian life) and do everything he wants us to do (obedience in Christian service) – the latter includes the grace of call and gift (of all leadership, priesthood and ministry). Ro 12/3: For by the grace given me I say to every one of you: do not think of yourself more highly than you ought. [the grace of Paul’s apostolic call, revelation and authority] Ro 12/6: We have different gifts, according to the grace given us. [the grace of spiritual gifting] Ro 15/15f: I have written to you quite boldly on some points, as if to remind you of them again, because of the grace God gave me to be a minister of Christ Jesus to the Gentiles… [same as Ro 12/3] 2 Co 8/1f: And now, brothers, we want you to know about the grace God has given the Macedonian churches… their extreme poverty welled up in rich generosity. [the grace of giving] 2 Co 8/6f: to bring also to completion this act of grace on your part…see that you also excel in this grace of giving. Both of these expressions of grace, by definition, are freely chosen/given by God and not earned/merited by us. We can do nothing to deserve forgiveness/acceptance and equally we can do nothing to deserve enabling/calling. To say ‘unmerited/free grace,’ therefore, is tautologous: all grace is unmerited; there isn’t any other kind. (One could perhaps say ‘unmerited favour’, as favour can be earned, coerced, manipulated or returned – but not grace.) So there is nothing we need to (or can) be/do to make God (more) gracious towards us in salvation or life. Some people who hear what I will go on to say (what grace is not), have said to me “You’re not into grace”… Are they mad? They’re clearly not hearing the fullness or the balance of what I’m teaching. I’m fully into grace! I get grace! We don’t have a perfect understanding of anything in this life, and we are always learning and growing, so along with you I’m on a journey of understanding and living in God’s grace more and more. But I know things about my life (pre and, sadly, post salvation) that no-one else knows – and I know that I got in Christ and am still in Christ only because of grace. And for the same reason I know that everything I’ve done for him is only by grace. The importance of this word “grace” was underlined for me while I was writing this book. Faced with a choice of continuing to live and work in England or offering to work for the church overseas, I went on retreat in an attempt to discover God’s hopes and expectations for my future. As I prayed and reflected, the call to live and work overseas crystallized. I could not ignore it, neither did I want to. I longed to be able to say a glad and ready yes. Yet, to my dismay, I found that, in my own strength, I was quite incapable of making such a costly, calculated choice. Eventually the proverbial penny dropped and I realized that, of myself, I do not possess the resources to make such a sacrifice, even for God. “I need your grace to help me to say ‘yes’” was the prayer I whispered one night as I was falling asleep. In the middle of that night, during a wakeful but peaceful hour, I found welling up inside me the resounding yes I had been struggling to squeeze out for several weeks. It was a humbling but joyful moment in which a profound truth was embedded in my heart: everything is grace. What is grace? Grace is God not treating us as our sins deserve; and grace is God enabling us to be/do everything he wants us to be/do in Christian life/service. Thus salvation, from first to last, is grace. Everything is grace!